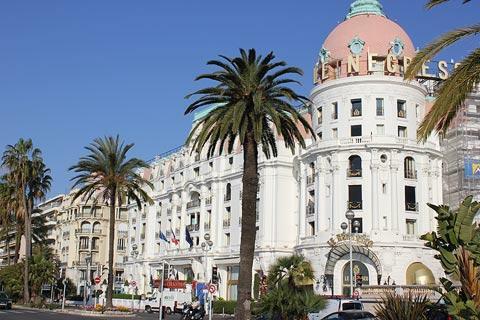 Nice is the largest and most visited resort on the Cote d'Azur - indeed, anywhere in France. It is also one of the most attractive resorts with a wide variety of things to see and do as well as hanging out on the beach! 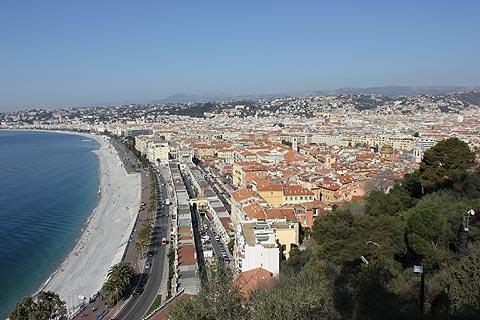 There is good reason for the popularity of the city and Nice has something for everyone: great weather, a very long beach, a historic old town and other grand architectural monuments; a wide selection of museums; lots of bars and restaurants of all standards...and your only challenge will be in deciding what to do in the limited time available during a visit (or dragging the children away from the beach). 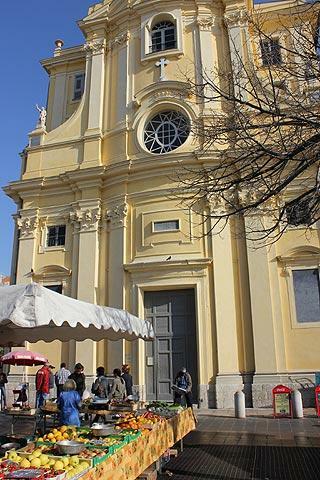 Despite its size Nice is an easy city to explore, with most places of interest focussed around the central area. If you are arriving by train you should use Nice Ville train station, then follow the Rue Jean Medecin to reach the center (by tram or about a 20 minute walk). 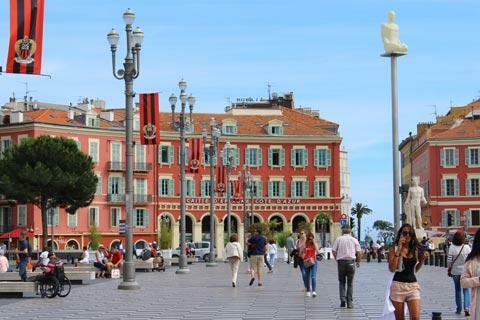 Perhaps the best known symbol of Nice is the Promenade des Anglais, a broad and very popular seafront walk several kilometres long that heads west from the city center. Towards the old town the promenade becomes the Quai des Etats-Unis. 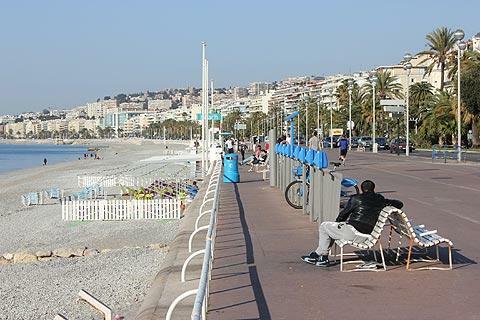 The promenade is used and enjoyed by joggers, cyclists (there is an allocated cycle path), and many people just enjoying the view and the sunshine. 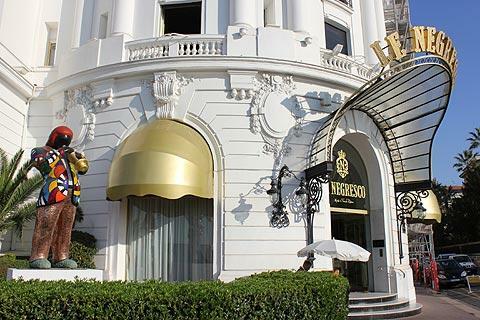 Grand houses (often now hotels and apartments) line the Promenade des Anglais for a few hundred metres west of Nice centre until you reach the Massena Palace, now a museum containing various interesting historical artefacts, and the Hotel Negresco. On the beach itself there are several cafes and restaurants. Beyond the Hotel Negresco (further to the west), although the promenade continues for several kilometres the buildings are more recent and of less interest, although the beach continues. 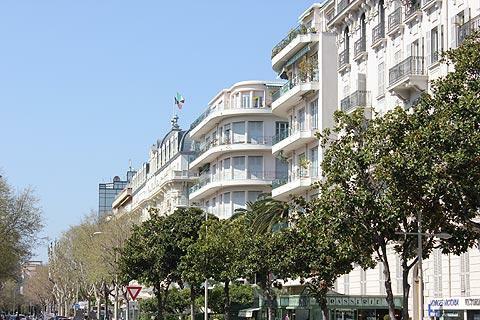 Note that if you are booking a hotel on or near the Promenade des Anglais you should be sure you are aware how far the hotel is from the city centre or you might have a long walk each morning! Heading inland from the Quai des Etats Unis towards the town centre you will notice a row of low cottages that have now partly renovated to hold cafes and art galleries. These traditional fishing cottages have been preserved as a symbol of 'old Nice' and called the Ponchettes. They appear slightly out of place in the center of such an upmarket resort, and it is remarkable that at no point have they been pulled down to build luxury hotels! Behind the Ponchettes is one of the most famous markets in France, the Marché aux Fleurs on Cours Saleya. 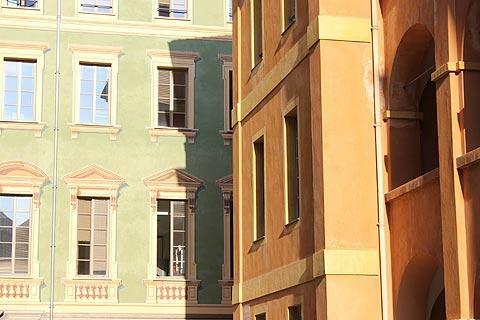 Best known for its flowers, the colours of the market will distract you, but be sure to also look at the buildings that line the street: there are a good number of interesting and picturesque highlights here, particularly to the east around Place Charles Felix. Cours Saleya is always lively, morning and night. 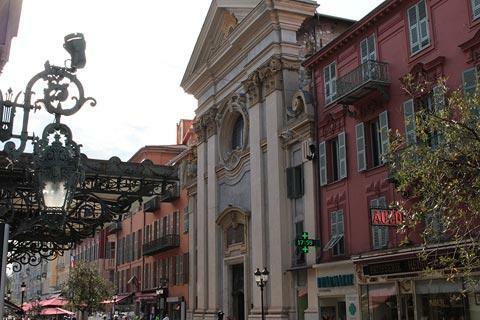 At the western end of Cours Saleya continue a short distance along Rue Saint-Francois de Paule to see the baroque church of the same name and also the grand entrance to the 19th century Nice Opera House. 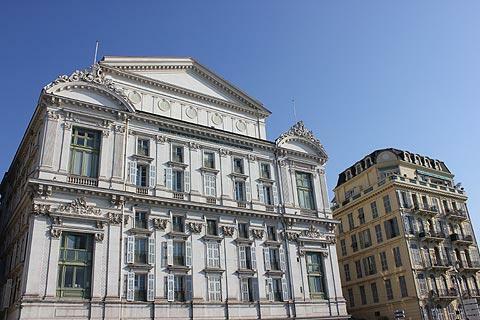 If there is an opera showing during your stay take advantage of it! The interior of the 19th century opera house is allso impressively ornate. 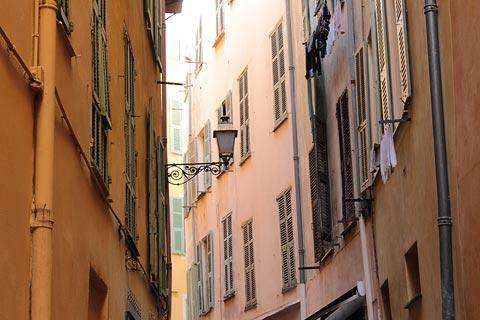 The old town in Nice is behind the Cours Saleya, and is an extensive area of tall old buildings, many painted in faded pastel colours, and open squares that also contains most of the most important historical monuments in Nice and a very large number of shops and cafes. Among the most notable monuments: the Palais de Justice (on the Place du Palais), is a grand colonnaded 19th century mansion; the domed cathedral of Sainte-Reparate is in the heart of the old town; the Saint Nicolas Orthodox cathedral; several other interesting churches (Saint-Jacques, Penitents-Noirs Chapel, SaintAugustin...). 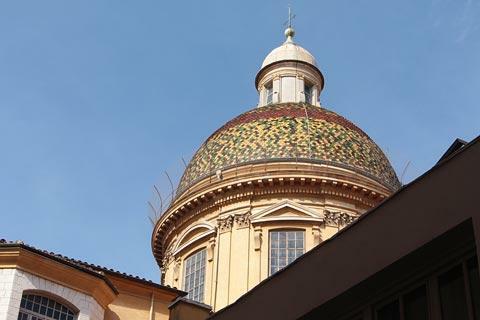 Also not to be missed is the impressive decorated interior, especially the ceilings, of the 17th century Palais Lascaris, towards the north of the old town on Rue Droite. 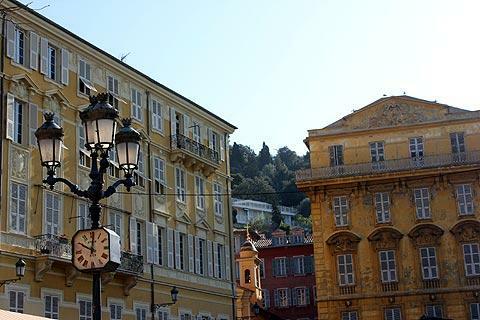 Impressive as these squares and buildings are the real pleasure of exploring Nice old town is in simply strolling along the narrow streets, cool and dark despite the heat of the day because of the tall buildings, and enjoying the bustling atmosphere. The streets all have something of interest but we particularly recommend the Rue du Marche and Rue de la Boucherie. 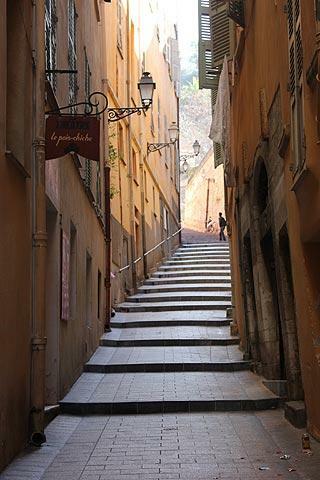 From the old town, you can follow the steps in Rue du Chateau (off Rue Droite) to leave the city center. At the top of the street pass through the entrance to the 'castle grounds' (there is no longer a castle here) and continue into the extensive park area on the hill. In the park you can take a picnic while you recover from the bustle of the city below. The main reason people visit the park is for the viewpoints across the city and along the coast - there are two separate viewpoints, one looking east and the other looking west. 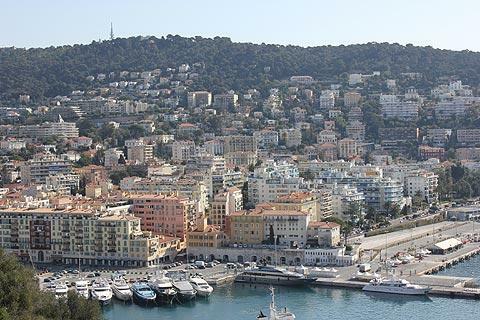 The view across the rooftops of old Nice and along the Promenade des Anglais is one of the highlights of your visit. 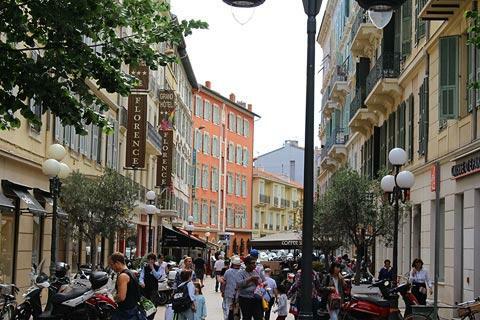 The area between Nice old town and the train station, along and around the broad Rue Jean Medecin, is the main shopping center in Nice and one of the most popular shopping streets in France. You will find all the main brand shops and many others, in an attractive area of 19th century mansion blocks and more recent additions. 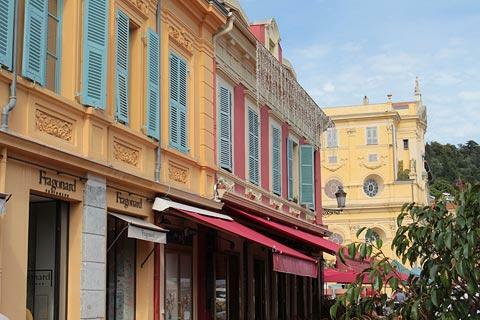 Start your visit (and recuperate from your shopping) in the extensive open square and gardens at the southern end of Rue Jean Medecin called Place Massena, a pedestrianised square with many grand buildings around its edges, many an attractive red colour with columns and arcades. About two kilometres north of the center the Cimiez region is very smart and sophisticated, and also includes some Roman remains and the Matisse Museum (below). The range of restaurants available in Nice is almost unlimited, and you will have no difficulty in finding restaurants suitable to your taste and budget...although in truth you will find it easier to find restaurants that are outside your budget - especially if you like to dine well in one of the splendid old hotels or a seafront restaurant, but there are plenty of more affordable restaurants in Nice if you explore slightly off the main tourist paths. Although a wide range of international cuisine is available, be sure to try some of the local delicacies. One of the most well known local food specialities is salade nicoise - boiled potatoes, green beans, boiled eggs, tuna and anchovies are the principal ingredients. Another dish, less well known outside the region, is the local crepes, made from chickpea flour and called 'socca'. These are common as a breakfast time food. Other specialities include ratatouille, stuffed peppers and the soupe au pistou (pistou being similar to Italian pesto). 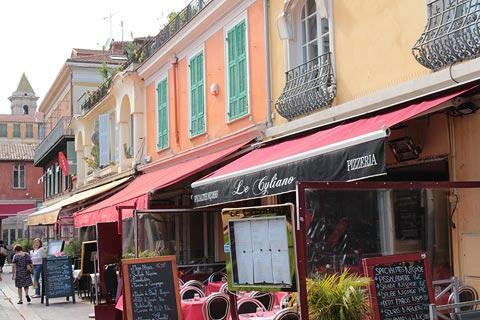 The influence of near neighbour Italy doesn't go unnoticed, and there are lots of restaurants in Nice serving Italian staples such as pasta and pizzas. 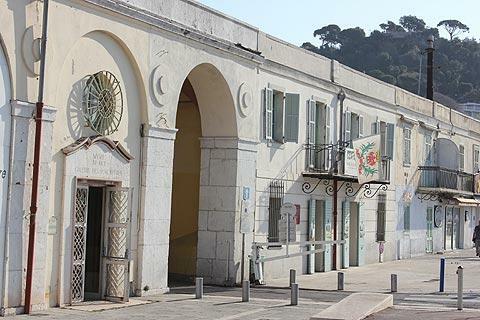 The Matisse Museum: Matisse lived much of his life in the Cimiez region of Nice, and the city was bequeathed a significant number of his works, including some very well known examples. 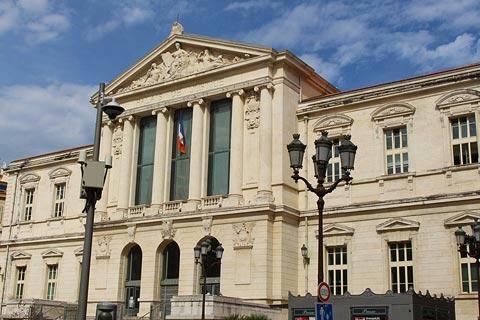 These paintings form the basis of the very important collection held at the Matisse museum, which includes examples of many styles of Matisse' artwork and covering a large period of his working life. The Chagall Museum in Nice has a very good collection by artist Marc Chagall - the largest in one place to be found anywhere in the world. Of particular note is the series of 17 paintings representing scenes from the Old Testament. The Museum of Contemporary Art focussed more on the 1960's and the pop artists such as Andy Warhol and Yves Klein. To avoid walking all day you can buy a ticket for the open-top 'hop on hop off' tourist bus which passes many of the most important sites including the Hotel Negresco, the Chagall and Matisse Museums and Arenas de Cimiez to the north, and the corniche road around Mont Boron to the east. A pass costs around 22 euros for one day or 25 euros for two days: rather expensive but it will stop your legs being quite so exhausted! 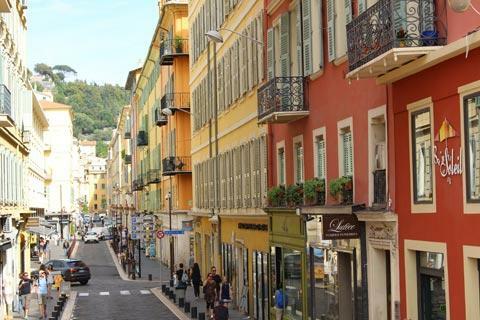 Although there is a great deal to see and do in Nice itself, you are likely to want to explore along the coast while you are here to see some of the other resorts, villages and scenic highlights. 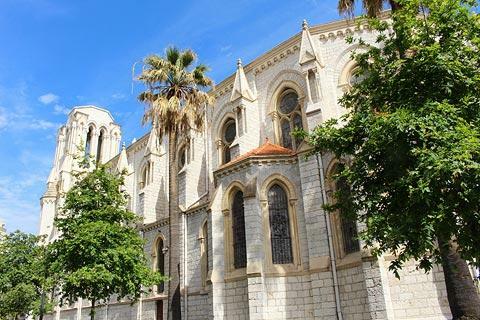 We suggest our favourite highlights nearby at short holiday in Nice. 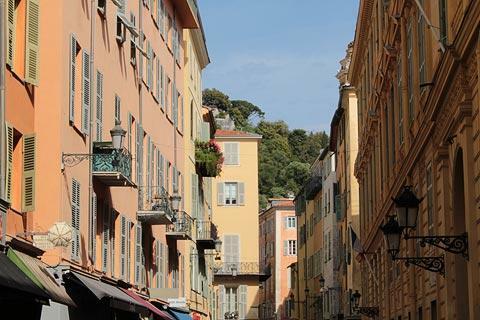 We also highly recommend you consider exploring by using the small train that starts at Nice and stops at many of the resorts along the cote d'azur: see cote d'azur by train.